If you are thinking of having people over for a dinner during the holidays, you may be looking for a first course. Here it is. There’s nothing quite as delicious to start off a festive gathering as a rich, wonderful soup. It may take a little time, but can certainly be made ahead and then simply re-heated when ready. 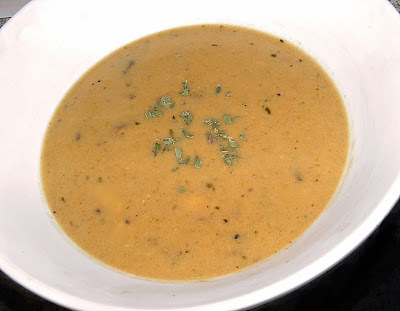 One may not think of mushroom soup as all that elegant, but when you add melted brie cheese and wine something magical happens – something deep and unexpected. I don’t really know how to describe it. This was inspired by a trip to Costco. They sell “family-sized” soups that actually sound interesting. One was mushroom and brie. I had never heard of it. Of course they add "stuff" to it to extend shelf life, so perhaps it’s better to make it at home. Soup is always better when made at home. Except for the dicing and chopping, this soup was a snap. It would be great for a family or for a table of 8. As a first course always make your servings smaller so you don’t spoil anyone’s appetite for your main attraction! Two ingredients are signature in this: the wine and cheese. Don’t buy anything that you wouldn’t serve on its own. The tastes really do come through. So make sure your wine is nice and your cheese creamy. Neither have to be expensive, just good. Don't add salt until the end. The chicken stock and brie can both add saltiness to the finished soup, so adjust at the end. I made this because I found white mushrooms on sale this week and already had some brie. In the recipe I call for cremini mushrooms. They will add a little more flavour than white. You could also use portobello or wild. This does have an acceptable amount of mushroom pieces, always a necessity for mushroom soup. You may want to sauté more than the called-for 16. It’s up to you. It depends on how hearty you want your soup to be. Each spoonful of this soup is bursting with flavour. Just make sure your main course can stand up to the competition! Roughly chop 16 of the mushrooms. 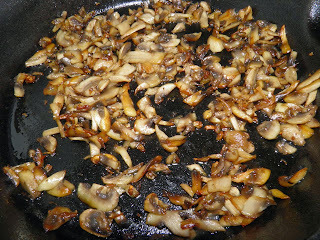 Melt 1/4 cup of the butter in a frying pan and sauté the chopped mushrooms until golden. Do not add salt. Set aside. Melt the remaining butter in a soup pot. 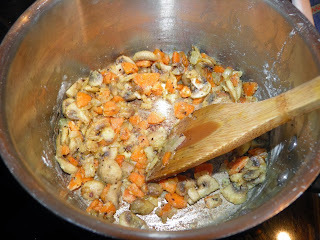 Slice the remaining 10 mushrooms and add to the butter. Dice the carrot and onion and add to the pot. Sauté until the vegetables begin to soften, about 5-6 minutes. Do not add salt. Sprinkle with the flour and sauté for a further 2 minutes, stirring so the flour doesn’t burn but darkens slightly. Add the stock, wine, thyme and a decent amount (1 tsp) of cracked black pepper. Bring to a boil, reduce heat to medium and let cook for 10 minutes. After the 10 minutes purée until smooth. Remove the white rind from the brie by barely cutting it away from the surface. Cube the cheese. Add the brie and browned mushrooms and stir until the cheese has melted. Taste for salt and adjust. Serve.